Lego have a scheme called Cuusoo through which they solicit fan designs for new kits and models. The system is simple: aspiring designers cook up a Lego set they’d like to see made and sold; you publish a Cuusoo page for your kit and get web users to endorse it; any kits that get 10,000 “likes” go before Lego’s official approval board. What’s more, any that are then sold pay a 1% royalty fee to the original designer. 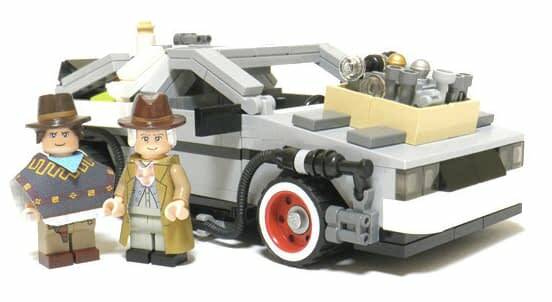 The latest Lego Cuusoo review took account of the Summer submissions and among them was a Back to the Future kit featuring the DeLorean, Marty and Doc. Today, Lego released this video in which – spoiler warning – they announce that DeLorean has been approved. Hurrah! If you watched that in full you’ll know that the 1% royalty payable to the kit designers is, in this case, being generously donated to a Michael J. Fox’s Parkinsons charity. And then, if you watched it in fuller, you’ll have seen the next wave includes a pretty large scale Star Wars sandcrawler. I think that one’s unlikely to make the cut, however. My hunch is that we’ll be seeing the Portal kit instead. I love the DeLorean. It’s got a pretty low brick count but it’s neat and trim and looks like the real thing just squeezed through the Lego filter. Well played, Universal, for approving this.